3 people recently viewed this XF. Super Space Cab, MX-13 510hp Engine, 12 speed manual, 490L Aluminum tank, Catwalk extra long, Jost Sliding fifth wheel, Fog and cornering lights, Skylights, Cab interior decoration Rustica (Wood), Super Air both seats (Half leather), Lower drawer 65 litres, Fridge, Microwave, Night heater, Xtra comfort mattress, Spring brakes on first front axle, MX Engine Brake, FIRST CHOICE - Part of the DAF premium used vehicle scheme, this vehicle has been prepared to the highest standard. 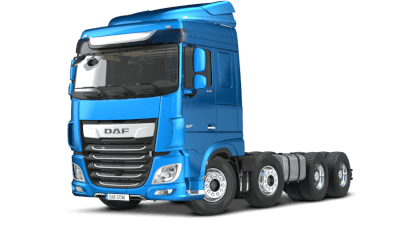 The vehicle comes with 6 Months FULL warranty available throughout any UK DAF dealership, Imperial Commercials are a main DAF Dealer, all vehicles advertised are inspected to high standards prior to sale. This DAF XF 2 door Tractor registration YX66NJN has a 12.9 Diesel engine with a Manual gearbox and is finished in the colour Black. * Road Tax figures correct as of 24th October 2018.